One thing that's been impressive over the years, is to see the pilot roster filled in for certain Spitfires. 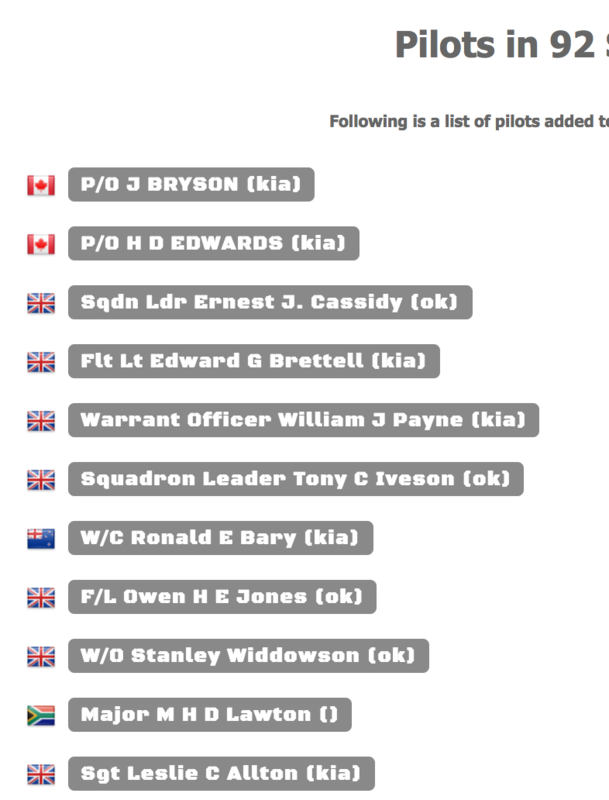 A user can enter Spitfire serials on a pilot's page, and, when this done for many pilots, the history fills in. Some of our users tend to focus squadron by squadron, airforce (e.g. "desert airforce") or campaign / date range. When that happens, we start to see particular aircraft patterns. For example, have a look at Spitfire JF692. 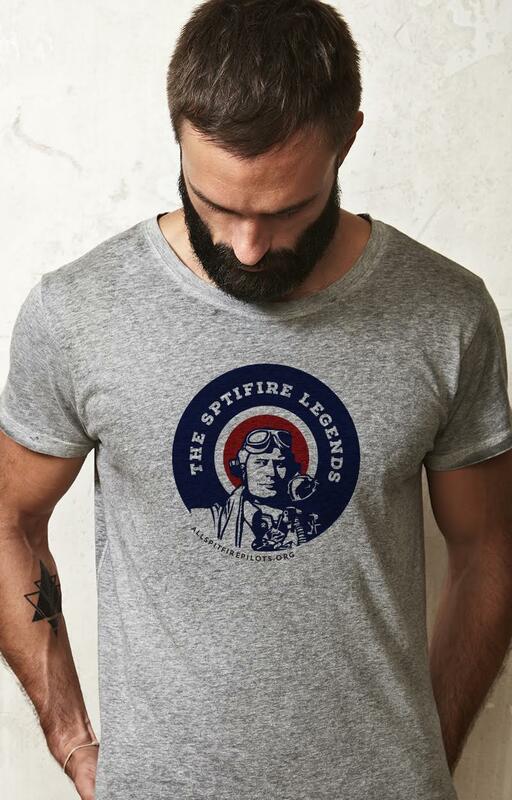 Most aviation and WWII Hurricane and Spitfire enthusiasts know about RAF Tangmere, a famous WWII Battle of Britain station known not only for sending up fighters to defend England, but also as a jump off point for Special Ops (SOE) missions. Google will of course turn up lots of information on Tangmere, with famous pilots Douglas Bader and Johnnie Johnson (who later led 127 Wing of RCAF) amoungst the many who flew from or served there. I was even recently able to find youtube high-def drone video footage showing the current tower in detail as well as the surrounding area. 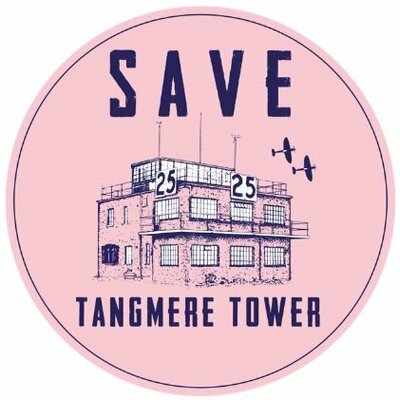 As I researched a possible cycle route last winter along the Kent coastline, and having read the fantastic novel "Wings Over Summer" by RAF Group Captain Ron Powell putting Tangmere into a first person narrative, I came across the current Tangmere tower online only to find it was virtually in ruins. How many ghosts wander nearby or keep watch from the derelict tower, I was captivated by the imagery and at once thrilled that it still existed, as if it was a best kept secret that shouldn't be. Many of know or at least may have heard that the RAF celebrates it's 100 year centenary in 2018. In fact, the official anniversary is today, April 1, which also happens to be Easter Sunday. If you are a UK resident or visitor this spring or summer 2018, there are many celebrations and events to take part-in; some with flying displays, some strictly planted on (or in) the ground. The RAF has protected the skies of Britain for 100 years and continues to do so, perhaps it's finest moment was the Battle of Britain where the Spitfire and Hurricane were the RAF's answer. 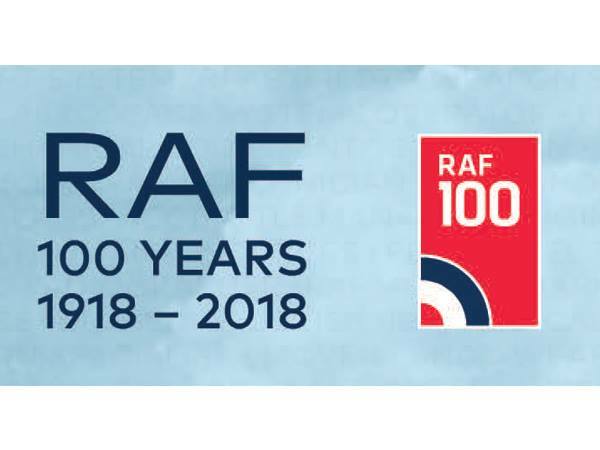 Here's a wonderful link to help you sort through the RAF 100 events, and, if you feel there are some must-see events, particularly those with a Spitfire flypast, don't hesitate to add a comment and / or use the contact us at the bottom of this page. ... and for those who want to read about a couple of former Spitfire pilots who are themselves as old as the RAF one of which who took to the skies on April 1, check this link out. My father recently asked me to drop by a few days before his own birthday, pointing to a small brown box that had come in the mail. He said, "it's for you". I curiously opened it and found myself in awe as I looked down at a beautiful Spitfire pin made from Duralumin fabricated metal, from the original P7350 that flew in the Battle of Britain. Wow! I had never seen this type of thing before, and, here in my hands was a part of flying history. I also wasn't sure how I became the recipient of a gift on his Birthday but there it was. 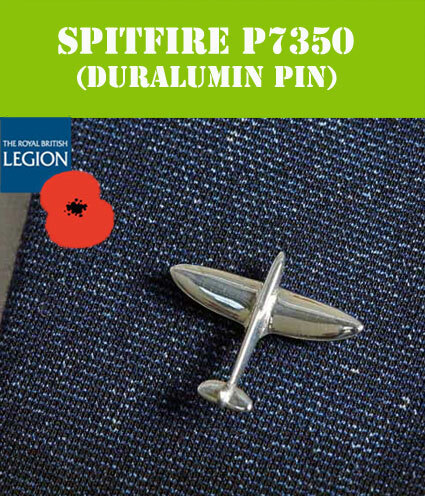 The 18mm wide (wingspan) lapel pins are sold by the poppyshop.org.uk, in support of the efforts of The Royal British Legion. All purchases made from the Poppy Shop help to fund the work of the Legion, providing practical support and advice to Service personnel, past and present, and their families. It's a great cause. The pin comes in a jewelley box, with a small certificate explaining the pin and where it came from. A Son's Tribute to 244 Wing of the Desert Airforce! 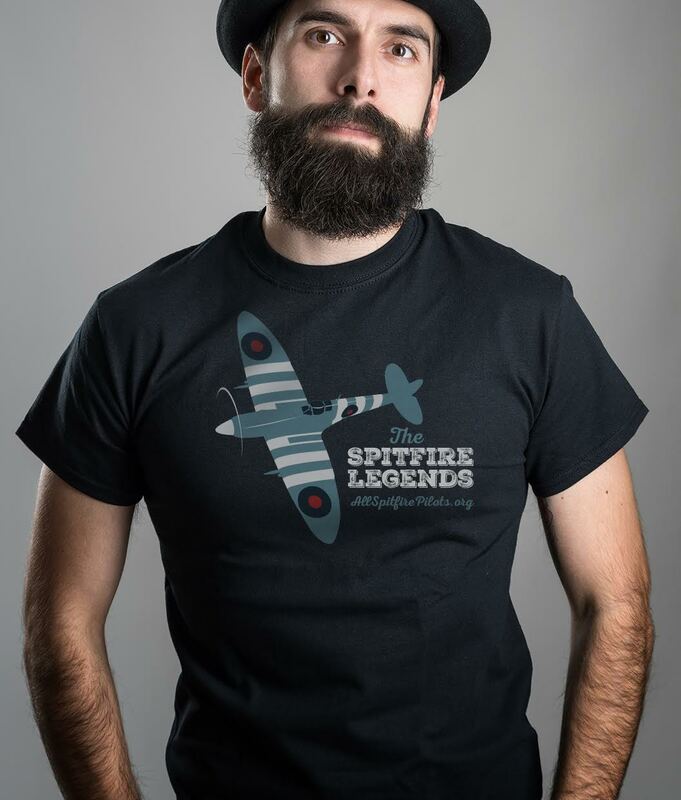 As the editor (and founder) for www.allspitfirepilots.org, I've been fortunate enough to be in touch with many sons, daughters, grand-children, nieces and nephews of former Spitfire pilots. What's almost universal about them is that in a quest to find out more, they typically end up researching a great deal about other pilots in the squadron or wing. 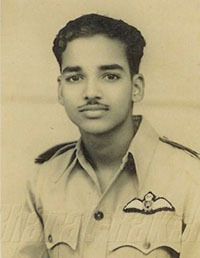 For Kevin Charles, son of Spitfire pilot Alan Charles, this is no different. You can check out Kevin's profile on this site to see the couple of hundred pilots he's posted, along with his own father's page. Kevin has posted a considerable amount of material on the Desert Airforce, and, he attributes that in part to long cricket matches on TV allowing him to read through the ORBs. In corresponding with Kevin, I requested a short article summing up his research interest and activity which you can read below. Plus he just located his father's log book, so stay tuned for more. 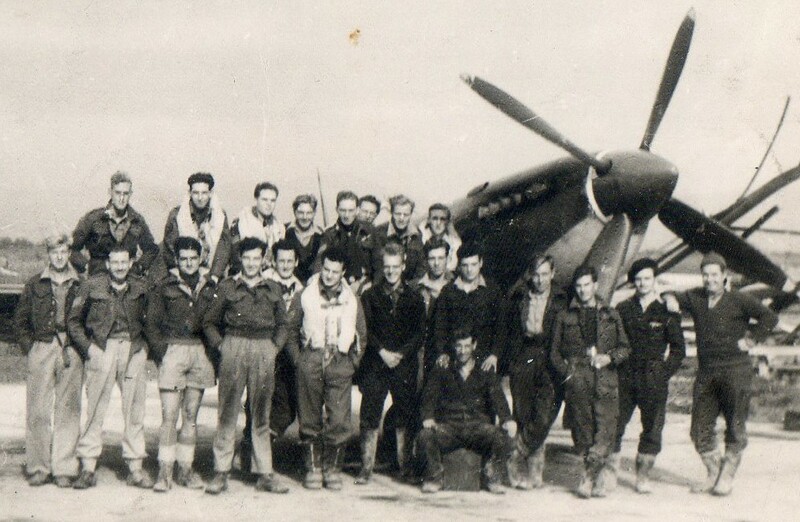 From Kevin Charles on Spitfire pilot Alan Charles and 244 Wing - the Desert Airforce! Greetings, as we head into fall -- a number of new features are being planned for the site. You may have already seen a few. For one, the squadron numbers and serials flown sections of a pilot page have been given more room, and, soon, more information (incident report) will be able to be added when adding a date / serial no in the pilots 'aircraft flown' section. That will move the site closer and closer to showing ORB / logbook details. A great escape of immense magnitude, where 338,000+ UK, French, and Belgian soldiers were evacuated from the choked pocket around Dunkirk. Director Chris Nolan has created what looks to be an extraordinary film using as much 'in camera' footage as possible, including real aircraft. The whole movie evokes a 'being there' sense that transports the viewer back in time. Dramatic, emotional, triumphant -- for saving the British army. On the eve of the Battle of Britain and what many feared would come next, the invasion of England itself.